So you are minding your own business, and a well meaning protestant comes up to you and tells you that the Catholic Church made up the pope in the middle ages, and that the Bible alone is the sole rule of faith. What do you do? 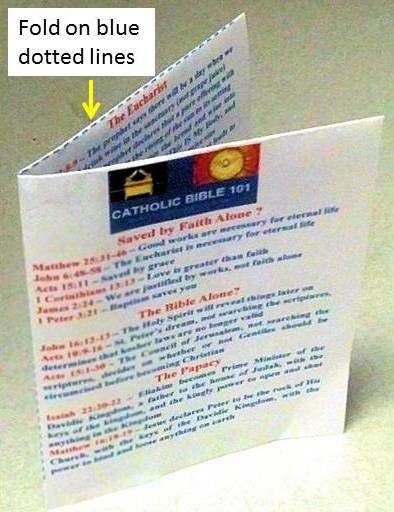 Well, if you had the Catholic Bible 101 cheat sheet in your pocket, it wouldn't be a problem for you. This one page pdf file, available for $1.99, has multiple apologetic topics listed, with appropriate bible verses that back up the teaching of the Catholic Church, which most protestants either have never thought about, or just ignore. But the whole bible is the Word of God, not just the verses that they may or may not like. You can download each one of the three for only $1.99 each, or if you prefer, you can download all 3 different cheat sheets with 24 different topics for only $5.50. What you get with your download is an 8 1/2" x 11" pdf file with the topics and bible verses on them. After you print out the pdf file, you fold the paper along the two dotted lines, and you get something similar to a 4 1/4" x 5 1/2" greeting card, with the topics and associated bible verses on 4 sides of the card, that you can stick in either your pocket or your purse. This is a companion to your bible, not a substitute, and it provides a handy reference guide for where the Catholic scriptures are located. Then, when you are confronted with a well meaning anti-Catholic, you will be ready for them, and you may even convert them! The purchase of this file authorizes you for one copy only, at $1.99. Clicking on the "ADD TO CART" link allows you to purchase the download with either PAY PAL or your credit card. Thanks for helping me out and keeping Catholicbible101.com on line. Most of the information on the site is free, but the server that it resides on is NOT free! Peace! NOW AVAILABLE - Catholic Bible Cheat Sheet #2! Peter is Petras, Christ is Petros? Call No Man on Earth Father? Confess To A Man, Or Directly To God? Are Good Works Useless or Necessary? If you would prefer to download all 3 cheat sheets in one file, for $5.50, please click on the icon below!